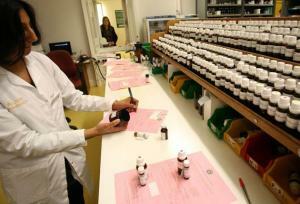 You are here: Home › Your Story › Homeopathy: Tinctures or a trick of the mind? This week, a Commons committee declared that the NHS should stop funding homeopathy, describing its remedies as no better than a placebo. Jeremy Laurance hears what the patients think. The Royal London Homeopathic Hospital may be under siege but the staff and patients remain relaxed. There has been no run on Gelsemium, the homeopathic remedy of choice for people paralysed by fear, in the pharmacy. Indeed, the only sign of trouble is the poster affixed to a pillar in the third floor waiting area alongside the stall selling Tick Tock redbush tea – the kind Precious Ramotswe drinks in The No 1 Ladies’ Detective Agency. “Save NHS homeopathy”, it says. Another poster urges supporters to join a lobby of parliament. Long before MPs from the cross party Commons committee on science and technology gave the thumbs down to homeopathy on Monday, people here knew what was coming. The remedies worked no better than a placebo, the committee said, and the NHS should cease funding. It was a withering verdict but the hospital remains undaunted. There are no placards or demonstrators here. Just the usual crowd of patients – predominantly middle aged and female – that you find in any hospital waiting area. Graham McClarty taps me on the shoulder, anxious to tell me what homeopathy has done for him. A former policeman, he used to be off sick with bronchitis for extended periods at least twice a year. He tried a course of homeopathy, the bronchitis cleared up immediately. Today he has brought his wife here. “I just wanted you to know,” he says. Linda Tricker, fizzing with enthusiasm and anxiety in equal measure, describes the digestive problems that brought her here which orthodox medicine was unable to solve. “I had more investigations and consultations than hot dinners. My file was becoming fatter and fatter – the doctors said I was neurotic and sent me away with anti-depressants. The NHS did nothing for me,” she said. Whether homeopathy has divine origins is for others to judge, but the level of enthusiasm shown by the patients I met during a two-hour visit was untypical of the average NHS district general. As Dr Sarah Eames, director of women’s services, was showing me around the pharmacy, a woman touched her sleeve. “Thank you for what you are doing,” she said, gazing into her eyes. The patients know they are getting special treatment, not available to most. It is exotic, too, with its “tinctures” and “provings” and “water memory”. The Royal London is the biggest of the four homeopathic hospitals in the country but it has just 20,000 out-patient visits a year, compared with hundreds of thousands in a conventional NHS hospital. There are 20 doctors, and although most are part-time they do not give the impression of being under pressure as in much of the NHS. All the staff, including the nurses and pharmacists, are medically qualified. This may be alternative medicine but it is the Rolls Royce model. In the pharmacy, Janvika Shah, pharmacist, is sticking a label on a jar of Calendula-Urtica cream. It contains mother tinctures to soothe eczema and other skin conditions. In front of her, rows of brown bottles with white lids carrying labels such as Aconite, and Pulsatilla, each have a coloured sticker to indicate the degree of dilution. Next to them glass tubes of tiny white inert pills, 120 in each, await the addition of seven drops of tincture, the “active ingredient”. The tube is shaken after additon of the drops and the tincture, in an alcohol and water base, vaporises so it rises through the pills. Patients typically take one or two pills a day, held under the tongue, for five days or until symptoms improve. Some call it snake oil, some believe it is the 21st century’s cure-all. More than 200 years after the birth of Samuel Hahnemann, the system of medicine he founded, homeopathy, is still the focus of scientific controversy. The origins of the treatment lie in the dissatisfaction that the young Dr Hahnemann, a German physician who practiced in the late 18th century, felt with the orthodox medicine of the time. His distaste for the then favoured treatments “blood-letting, purging and burning and the administration of toxic substances such as arsenic and mercury” was not difficult to understand and it led him to devote his energy to his “beloved chemistry”. One of his earliest experiments involved the drug quinine, used to treat malaria. He had read that it was effective because it was bitter and astringent, but realised that, if this were the case, all bitter and astringent substances would be effective, which they clearly were not. By testing it on himself he discovered that it produced symptoms of fever similar to those produced by the disease itself and he speculated that this could be the real secret of its curative power. He began to test other drugs on himself, his family and friends, such as belladonna, camphor and aconitum to study the symptoms they produced.But it was not until 1796 that he “first communicated to the world by means of public print his new discovery in medicine”. Today it flourishes as one of the leading branches of complementary medicine, with millions of adherents across the world. Walk into any high street chemist and in the complementary medicine section you will find arnica, nux vomica, pulsatilla and rhus tox on the shelves. The Queen, David Beckham and Geri Halliwell are among those said to swear by them.